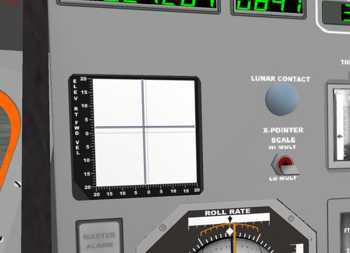 The following graphic shows the ‘actual’ LM panel from the Virtual View. In Cockpit View the instruments are rearranged to make better space on the screen. The X-Pointer will display your forward and lateral velocities. You can change the scale with the switch at the right under the Lunar Contact light, or pressing the "H" key. As you descend vertically keep your horizontal velocity rates nulled by observing this gauge along with the FDAI ball. 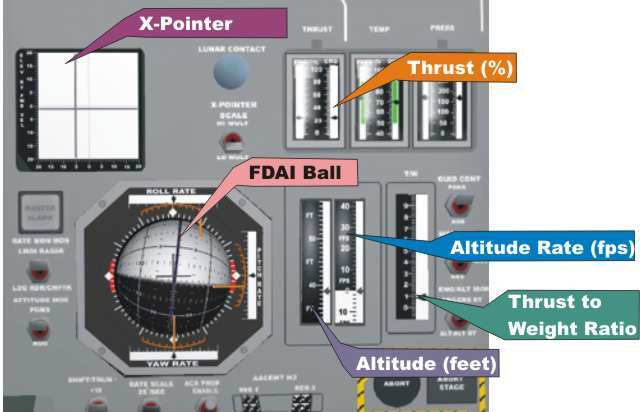 The FDAI ball is an attitude indicator. It is much like an aircraft attitude indicator except it also shows the amount of yaw in degrees. The three arrows on the top, bottom and right side display pitch, roll and yaw rates. 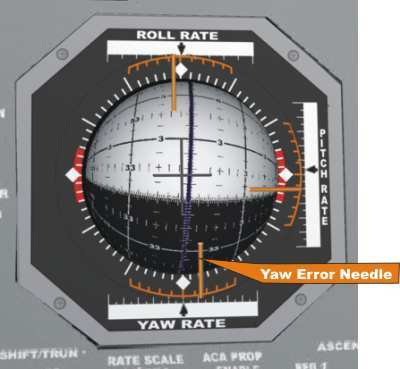 The three corresponding orange needles show pitch, roll and yaw error. A deflection of a needle away from center is an indication that you should roll, pitch or yaw toward the needle until it centers again.